Pattern Preview Central & Giveaway Fun! Well, today is the day! I have some fun stuff in store for all of you so be sure to read all the way to the end! The new patterns are out for preview and will be available for purchase from your local yarn shops and online in January 2010! Here is a quick look and link session for you. Have you ever seen two cuter pixies than these? Rachel Russ is our resident expert on fair isle and she designed this playful pattern for Spud & Chloë. 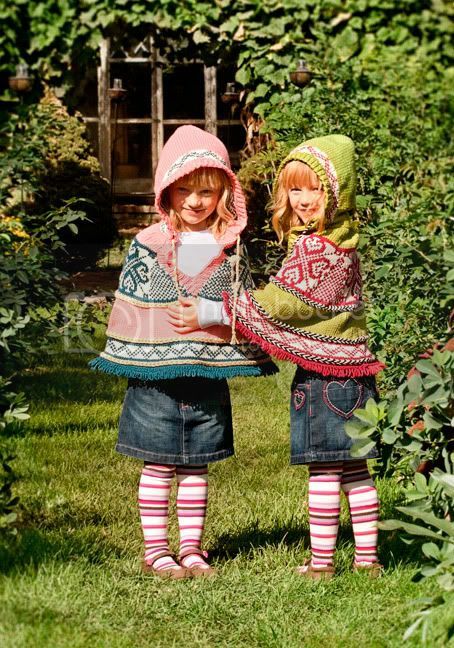 The photo above is of our new Pixie Poncho pattern knitted up in Spud & Chloë Sweater. Here is the link for more information on the Pixie Poncho pattern. Here is the Ravelry link for the Pixie Poncho! The Three Brrr Bears is my latest toy pattern for Spud & Chloë. The cool (get it?) thing about this pattern is that the size difference in the three bears is due to yarn changes. The largest bear is knit in Outer, the medium bear is knit in Sweater and the small bear is knit in Fine. With a few minor length modifications to get proportions right, it is the exact same pattern for all three sizes. It is way cool and way fun to knit these playful, squishy, lovable polar bears! Here is the link for more information on the Three Brrr Bears pattern. 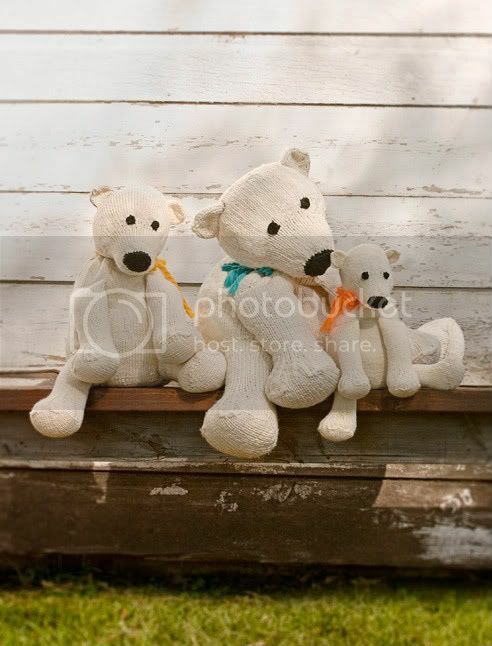 Here is the link for the Three Brrr Bears! I love the Lil’ Man Vest by Alana Dakos. What a treat this one is knit up in Spud & Chloë Outer. You’ll have this one whipped up in a matter of hours. Simple and wearable and sweet all rolled into one fast knit! Here is the link for more information on the Lil’ Man Vest. 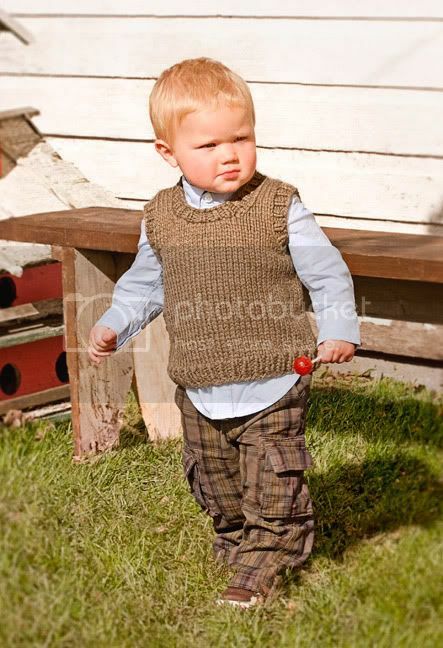 Here is the Ravelry link for the Lil’ Man Vest! These are about the best Sassy Stockings ever! The stockings are a joint effort by Rachel Russ and Colleen Powley. The stockings are knit up in Spud & Chloë Fine. 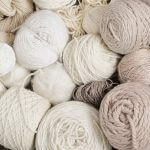 I am thinking about all of the color combinations you could come up. What fun! Here is the link for more information on the Sassy Stockings pattern. Here is the Ravelry link for the Sassy Stockings. Who doesn’t love a Tea Party Cardi? This sweet and breezy cardigan works up in a flash in a broken rib pattern and knit in Spud & Chloë Sweater. Bobbi Intveld designed this pattern just for you! What a versatile little knit, love the 3/4 length sleeves on this one. Here is the link for more information on the Tea Party Cardi. Here is the Ravelry link for the Tea Party Cardi. If you want to add some bright and sunny fun to your wardrobe this one is for you! I love the fun spirit behind Kim Hamlins’ Tiptoe Cardigan. The flowers are fabric applique and the cardigan is knit up in Spud & Chloë Sweater. Here is the link for more information on the Tiptoe Cardigan. Here is the Ravelry link for the Tiptoe Cardigan. 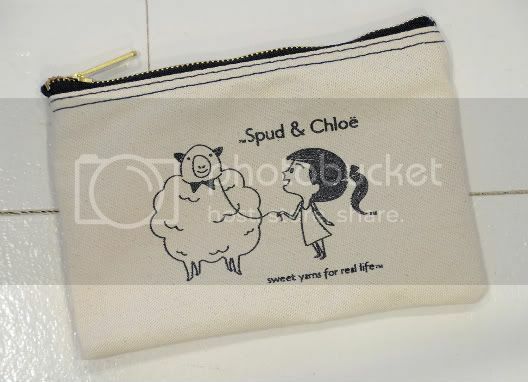 Okay, and last but not least, I have some news on this adorable canvas Spud & Chloë pencil bag. After I talked about this bag on the blog I had lots and lots of requests to purchase this pencil bag featuring our friends, Spud and Miss Chloë! I am happy to announce that the bag will be available for purchase in January 2010 and will be retail priced at under $10! If you are interested in purchasing a Spud & Chloë pencil bag please request one at your local yarn shops! Shops carrying Spud & Chloë can easily order these bags to have in their shop as well. Now for some added fun for all of you!!! We are hosting a kick off giveaway! I have been given the go-ahead to offer a Spud & Chloë pencil bag and your choice of one of the six brand new preview Spud & Chloë patterns that I have shared today. There will be two lucky winners! To enter simply leave a comment on Spud says! (that’s right here!). Say hello or whatever you’d like (in a kind and nice sort of way) and you will be entered. It’s as easy as that! Enter quick because I will come back and pick a winner sometime very soon. After two winners are randomly selected I will post the winning comments. You will have a couple of days to contact me with your mailing addresses so we can send you your bag and selected new pattern. Have fun and let the comment party begin! Also, excitingly enough, Outer has made its Knitty debut with the beautiful hat design, Shroom, by Lee Juvan. 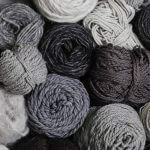 You need 2 skeins of Outer. Here is the link to the free pattern for Shroom! The pencil bag and pattern giveaway is now closed! Thanks for entering and for all of the kind comments! Tiny Elf – Free Pattern! Two Winners & a Fresh Idea!